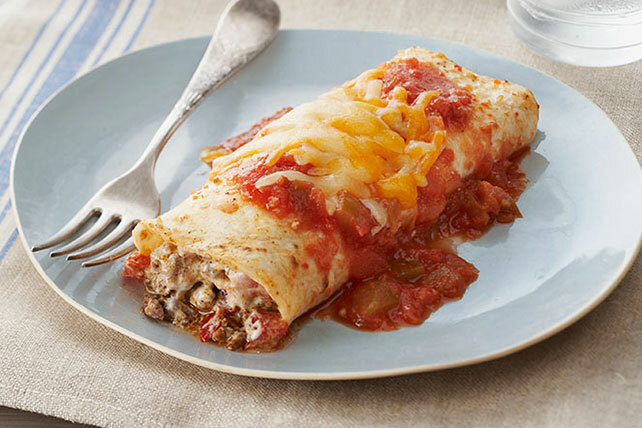 These tasty beef-stuffed tortillas can be ready, from start to finish, in just minutes. Brown meat in large nonstick skillet on medium heat; drain. Return meat to skillet; stir in peppers and chili powder. Cook 5 min. or until peppers are crisp-tender, stirring occasionally. Remove from heat. Heat broiler. Add sour cream and 1/4 cup cheese to meat mixture; mix well. Spoon down centers of tortillas; roll up. Place, seam sides down, in 13x9-inch pan sprayed with cooking spray. Drizzle with dressing; top with salsa and remaining cheese. Broil, 6 inches from heat, 3 to 5 min. or until cheese is melted. Save 40 calories and 5g of fat, including 2.5g of saturated fat, per serving by preparing with extra-lean ground beef, KRAFT 2% Milk Shredded Sharp Cheddar Cheese, KRAFT Lite Zesty Italian Dressing, and BREAKSTONE'S Reduced Fat or KNUDSEN Light Sour Cream.